One shadow hanging over the Russian art market was dispelled in London this week when the British Government’s media campaign against wealthy Russians failed to deter record sales of Russian artworks at the leading London auction houses. Together, sales by Christie’s, Sotheby’s, MacDougall’s, and Bonhams fetched £21.7 million. That is three percent better than they achieved in June of last year. MacDougall’s set a house record, with an increase in value of its sales by 49% over a year ago. Christie’s also sold 35% more in value of Russian artworks. Sotheby’s, however, recorded that its auction of Russian paintings fell to £6.9 million, down from £9.9 million in June of 2017, a drop of 30%. And this is a new shadow in the Russian art market which leading European art dealers are reluctant to discuss openly. Russian collectors, buyers and sellers of artworks say they are well aware that Sotheby’s is accused of colluding with the Swiss dealer, Yves Bouvier, to rig art prices and defraud buyers. A London High Court claim, seeking hundreds of millions of pounds in compensation and penalties, brought by Dmitry Rybolovlev, former owner of Uralkali, Russia’s leading potash producer, is due to start shortly. At the same time in Geneva, a criminal court proceeding is underway against Bouvier and his associates for price rigging and fraud against the Kaliningrad auto manufacturer, Vladimir Scherbakov. A third Russian art collector, real estate developer Boris Mints, is under investigation by Central Bank regulators and the General Prosecutor in Moscow; Mints has allegedly diverted bank loans into personal assets, and fled for refuge to London. 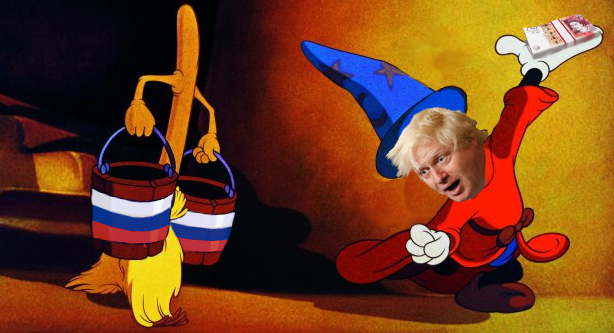 If the semi-annual Russian Art Week in London puts money where British mouths want to be, this week’s auction results are a defeat for the anti-Russian campaign stoked by Foreign Secretary Boris Johnson (lead image, right) and the British media. Wealthy Russian art buyers are as hostile to the Anglo-American war aims as other Russians. This was first evident at Russian Art Week a year ago, when Russians demonstrated their readiness in the auction room to pay premiums for paintings of Crimea, and to return Russian artworks from the hands of American museums and collectors. Left: Ivan Aivazovsky, “The coast of Koktebel, Crimea” painted in 1889; sold by Christie’s on June 4 for £200,000, 25% above the top estimate. Right: Aivazovsky’s “Sunset in Crimea” painted in 1878, sold by Sotheby’s on June 5 for £150,000, more than double the estimate. Russian bidding this week beat auction house estimates by the largest multiple in the case of the Soviet painter, Konstantin Somov, whose 1933 self-portrait was sold by Christie’s for £172,500. The house experts thought it would fetch £12,000. Pavel Tchelitchew’s portrait of an English boyfriend, painted in 1934, has been returned from an American collection at £418,000, sold by Sotheby’s 20% above the top estimate. 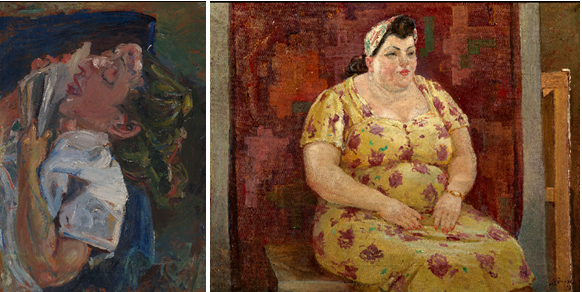 Works by Alexander Yakovleff, a post-revolution exile in Paris, also beat estimates — “Harlequin” of 1922 sold by Sotheby’s for £730,000, more than triple the estimate; “Dancer in Spanish Costume” sold by Christie’s for £1.1 million, almost double the estimate. MacDougall’s achievement in reaching the value levels of Christie’s and Sotheby’s is a demonstration that Russian fine art buyers are now favouring the house which specializes in works sought by low to mid-priced buyers who put their collections on their own walls, rather than storing them in tax minimization schemes such as freeports or private museums. The most expensive of works in the MacDougall’s catalogue, an 1889 pine forest by Ivan Shishkin estimated at £1.2 million, and a 1936 work by Konstantin Somov valued at £700,00, failed to sell. Left: Chaim Soutine, “La liseuse endormie, Madelaine Castaing”, 1937, sold by MacDougall’s for £358,800, 28% below estimate. Right: Alexander Deineka, “Woman in a Yellow Dress”, 1955, sold for £345,300, 31% below estimate. Both works return to Russia from European owners. 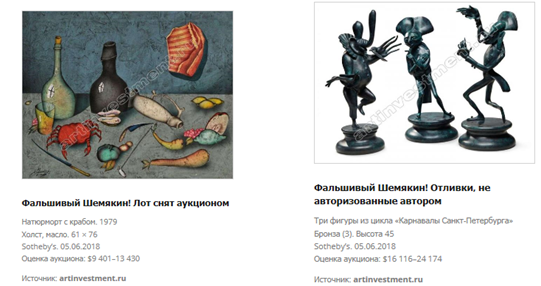 Sotheby’s has been embarrassed by discovery, just before auction day, that three sculptures by the contemporary Russian artist Mikhail Shemyakin had been cast without authorization from the artist, and that one of his paintings had been forged. An investigation reported by ArtInvestment.ru reveals that a 1981 still-life of crab and vegetables, reproduced in a 1986 publication, had been copied. Shemyakin had earlier warned about the counterfeiting which he suspected was being done by another Russian artist who was living in New York. Three bronze statuettes, also offered for sale by Sotheby’s this week, were inferior castings and had not been carried out by him, the artist told the auction house. Sotheby’s then removed the four pieces from the auction and the online catalogue. The illustrations (below) which appear in the Moscow publication were taken from the paper catalogue. Bonham’s is the fourth of the London auction houses with a dedicated Russian art sale in June and November. This week its grand total of sales came to £1.2 million, 20% below the year-ago result; it slips further behind its rivals. The two big-ticket paintings in the Bonham’s sale reflect the trend in Russian market demand for Soviet-era painters at mid-range prices – Nikolai Fechin’s “Still Life with Daisies” for £236,750 and a Deineka for £137,500. 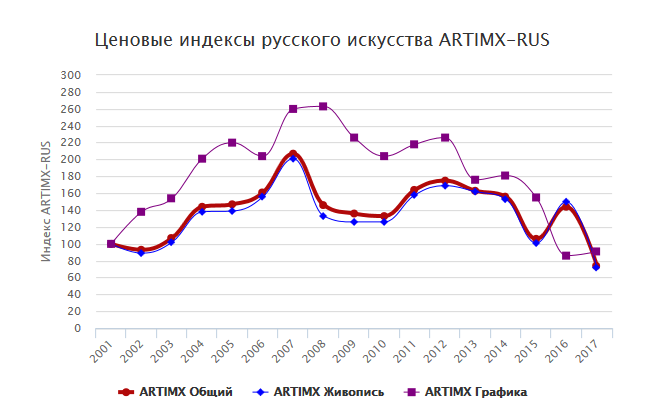 In Moscow compilation of art sale data, which do not include the London sales, indicates how closely demand for fine art follows after the movement of income. This peaked in 2007; declined during the 2008-2009 recession; recovered by 2012. The American war years beginning in 2014 also saw the decline of oil price-related Russian incomes, so the index for art purchases fell. It rose in 2016, then plummeted in 2017. If this week’s London results are indicative, in 2018 the Moscow indexes will recover. The domestic art market has so far been unaffected by the price-rigging, fraud and money-laundering cases associated with the art storages known as freeports in Geneva, Luxembourg and Singapore where Yves Bouvier has been in control for many years. The details of that story, and of Bouvier’s Russian operations, can be followed here. Investigation by prosecutors, police, and investigative journalists in Switzerland, Luxembourg, and France continue to add to the names of Bouvier’s agents, accountants, and managers of the system of offshore art sales he offered to Russian buyers with tax incentives. The investigations are also being spurred by a campaign by Ana Gomes (right), a European Parliament deputy from Portugal. 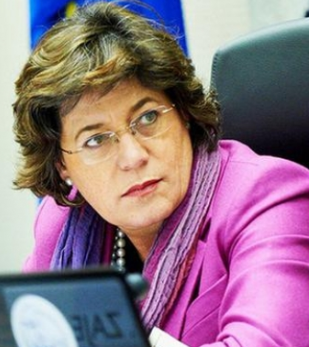 “The criminals of this world,” she told a Portuguese reporter in Luxembourg this week, “have come to resort to these schemes that make valuable goods disappear for a while, as in the case of freeports.” Gomes was one of the leaders of an investigation by a parliamentary committee between July 2016 and December 2017 which reported its findings and recommendations last November.